“A person’s measurement of success is not by how much money he has but by how much the same success affects other people. You cannot only look at your own success but also see that others around you succeed too. Then you can say that you have succeeded in life.” These are the words of Tatay Felix Garcia, founder of Mekeni Food Corporation. For those who have seen the havoc wreaked upon by the eruption of Mt. Pinatubo in 1991 it was devastatingly clear how Porac, Pampanga was almost wiped off the Philippine map. So creating jobs in the lahar-stricken town seemed like a crazy idea to most people. But Tatay Felix and Imang Meding Garcia weren’t most people. They believed in sharing hope and creating a spark in the darkest moment of their lives. That spark ignited a light for the people of barrio Balubad, and transformed what was then an ashen ghost town into the thriving community that it is today. What they started 30 years ago is now being continued by their children and grandchildren. More than producing world-class quality food products that continues to bring honor to the country, Mekeni Food Corporation is remembered and recognized as a Filipino family-oriented company that offered employment opportunities to the lesser privileged which contributed in building a happy, committed and productive community despite the major calamity. Mekeni lives up to its name of always being open and welcoming. Through the years, they have gladly welcomed both challenges and opportunities, relying on their faith in their people and an even stronger faith in God. 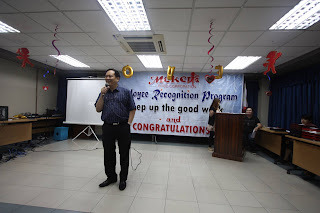 So whenever awards and recognitions are accorded to Mekeni, it is not only the company that takes pride in its own achievements but also the whole community shares in the joy and honor given. Because Mekeni believes that their best asset are the people who stick with them through thick and thin. Now celebrating their 30th Year with the theme “30 Years of Uplifting Filipino Lives”, Mekeni continues its mission to provide employment opportunities and contribute to the improvement of life within and beyond the community. In their recent thanksgiving celebration, Mekeni did not only celebrate their milestones, but also celebrated their employees' achievements. Promoting the value of the 5Rs in their people (Relationship, Respect, Result, Rewards and Recognition), they gave their outstanding employees awards and recognition for their excellent service to the company. Amazingly, some even beyond the call of duty! Group awards and recognition were given for the Best Good Manufacturing Practices (GMP), Best 5S Practitioners, HACCP/Food Safety Management System Team, Internal Audit Team, Safety & Health Committee, HR Point persons Team, Emergency Preparedness & Response team, 5S team, Mekeni Dancers, MFC Chorale, Best Delivery Team National Category, and Outstanding Factory Outlet Team. Individual awards and recognition were also given to the Most Outstanding Admin Personnel, Best Account Analyst, Perfect Attendance, Outstanding CSLM Support Personnel, Best Delivery Crew/Helper, Best Lead Delivery Crew/Helper, Best Delivery Driver, Best Cash & Goods Model, Service Excellence, and Loyalty Award for those who have been with the company for 10 years or more. This is what makes Mekeni successful, they value their people and their contributions; showing them that they and their family are always part of Mekeni. In the same way, this is why the employees are happy to stay on, because they are all treated as valuable assets of the company. In keeping with their thanksgiving party tradition, Mekeni did not let any of their employees to go home empty-handed. Everyone took home a sack of rice, assorted grocery items, and a pack of their Picnic Super Jumbo hotdog, all courtesy of the management. After many decades, Mekeni is still grateful for all the blessings that let the company continue this practice. Lastly, Mekeni thanks all their valued customers in the Philippines and throughout the world where every Filipino have been served their delicious world-class quality products. It is through them that Mekeni continues to grow not only as a company but also as a community builder that will continue to provide opportunities and uplift poverty in the community that they serve. Truly, Mekeni is committed to be a partner of growth not only in the province where they built their reputable company, but also in the entire country where they have been happily and productively working with their dealers and distributors nationwide. With their commitment to build people, Mekeni hopes and prays that they would sustain their passion, commitment, loyalty and pride in both triumph and challenges. It is their faith in their people and most of all their faith in God that makes them what they are now, 30 years of world-class quality food products and dedicated people.